A deathbed confession and a long-hidden conspiracy are at the heart of a riveting historical mystery centered on the assassination of Abraham Lincoln. In March 1900, as former Congressman John Bingham of Ohio lies dying, he begins to tell a strange tale to his physician, Dr. Jamie Fraser. Bingham famously prosecuted eight members of John Wilkes Booth's plot to kill Lincoln. But during the 1865 trial, conspirator Mary Surratt divulged a secret so explosive it could shatter the republic. Though Bingham takes the secret to his grave, Fraser cannot let go of the mystery. Bored with small-town medical practice, he begins to investigate, securing an unlikely ally in Speed Cook, a black, college-educated professional ballplayer and would-be newspaper publisher. Cook is fascinated by Fraser's inquiry and, like Fraser, thinks the accepted version of Lincoln's assassination rings false. Was Booth truly the mastermind or were other, more powerful forces pulling the strings? From Maryland to New York City, from Indiana to Washington, Fraser and Cook track down key figures and witnesses--including Mary Surratt's neurotic daughter Anna, Booth's nephew, actor Creston Clarke, and Clarke's attractive business manager, Mrs. Eliza Scott. Piece by piece the truth emerges--separating fact from rumor, innocent from guilty, and revealing a story of greed, ambition, courage, and tragedy. 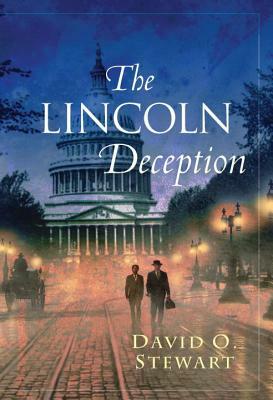 Blending real and fictional characters, The Lincoln Deception is a superbly researched, brilliantly plotted and thoroughly gripping mystery that explores one of the nation's darkest and most fascinating eras and the conspiracy that changed world history. David O. Stewart is an award-winning author and the president of the "Washington Independent Review of Books". He is the author of several acclaimed histories, including "Madison s Gift: Five Partnerships That Built America"; "The Summer of 1787: The Men Who Invented the Constitution";" Impeached: The Trial of President Andrew Johnson and the Fight for Lincoln s Legacy"; and "American Emperor: Aaron Burr s Challenge to Jefferson s America". Stewart s first novel is "The Lincoln Deception".